those guys must be retards, coz i used to always think that this is the proper way for newspapers to work. So i have been thinking that this is the normal way to be but THEY just NOW thought of that! horrible, i usually thought i was dumb, these guys have surpassed even me! As far as the question asked… I don’t believe that newspapers without website can exists..sauf dans 1 pays ki dans pince meme, since, ppl like to read archives.. just like myself, am going to have some time to check out last month lottery numbers. 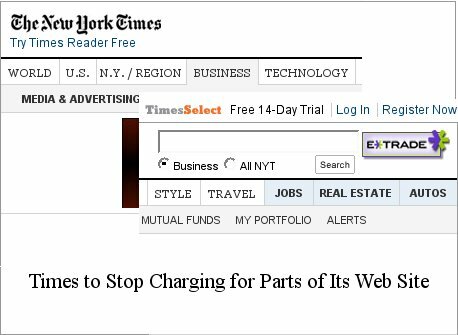 I’d rather pay and get pages without adverts (I’m sick of blocking adverts using my browser), and with other features -> like being part of a private user generated content community (say /. digg, delicious, etc, but in a private way). Paying brings more fun! It’s like paying for email which brings extra benefits. The article I quote mentions that some paid to view the Times’ contents. But the vast majority were not regular Times readers and came via search engines. They were not willing to pay to read one article. Back @ the Times article -> If I stumble onto a paid article, I usually get to read a summary. From that summary, I can obtain key information to obtain more info from other free sites. Times is NOT outdated because it stopped being paid. All other newspapers including Times, ARE outdated for they are not centered around a community. Hence, the exponential rise of digg and other community sites. geek$ need easy money! click and help your fellow geeks. I think that ads are a nice thing as stated. Well, the ads add content to the website. And in the hope of getting money. Nevertheless, I believe that even if you don’t get a superb revenue from the ads, it doesn’t mind! Readers are the most important things. And there are other ways of making money! !